Many adults with type 1 diabetes self-monitor blood glucose (SMBG) less frequently than recommended. Case reports suggest that features of the MobileTM meter (e.g. strip-free) may influence self-monitoring behaviour in this group. 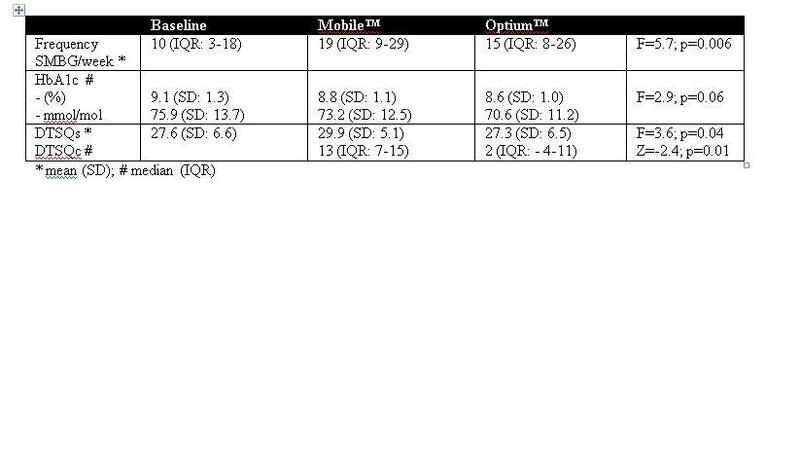 Therefore this randomised controlled cross-over study was designed to determine whether the use of either the Mobile™ system or Freestyle Optium™ would result in more frequent SMBG. Primary outcome is frequency of SMBG per week. Secondary outcomes include glycaemic control (HbA1c), treatment satisfaction (Diabetes Treatment Satisfaction Questionnaire - status (DTSQs) and change (DTSQc)) and meter preference. Thirty-four participants with type 1 diabetes (mean (SD) age 34.4 (11.0) years; median (IQR) duration of diabetes 16 (7-21) years) have completed the cross-over study to date. SMBG frequency increased in both groups but participants monitored significantly more often using the MobileTM meter. They also reported significantly higher treatment satisfaction. There was a small but non-statistically significant trend toward improvement in HbA1c for both monitoring systems. At completion of the crossover study (3 months using each meter), participants were invited to continue with their meter of choice in a 3-month extension. 78% of participants indicated that they preferred to use the MobileTM meter during this period. Our results indicate that the MobileTM meter improves both SMBG frequency and treatment satisfaction. After experience of both systems, Mobile™ was the meter of choice for the majority of participants in this study.